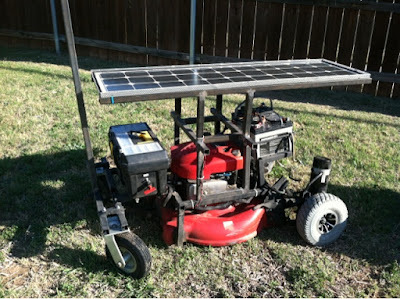 My 2013 mowbot now includes a working solar battery charging system. The batteries are full, but they only provide the propulsion, not the cutting power, so it still requires gasoline. 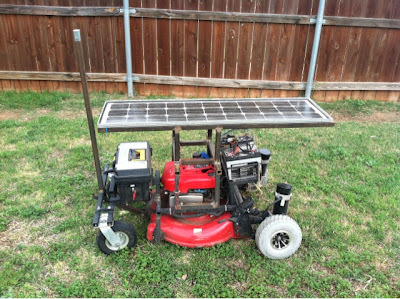 There have been a mess of improvements made since I last updated the "Robot Mower" page above, and I am obviously terrible at documenting things like this, so here are some nice lists for your enjoyment. The solar panel was donated by my mom's neighbor (thanks!) and outputs around 19 volts under full sun. This thing must have been old, because it came with aluminum wiring, which I found odd. My mowbot gets propelled by 24 volt DC motors, so the panel alone won't do me much good. Inside the toolbox (at the front of the mower) all of the electronics sit somewhat protected from the elements. From left to right you can see the battery "fuel" gauge, charger enable/disable switch, charger ammeter, 110 volt wall charger input, brake controls and 2.4ghz receiver (RX). The antenna in the middle belongs to a 5ghz video transmitter (TX) providing a video feed to my nonexistent base station. 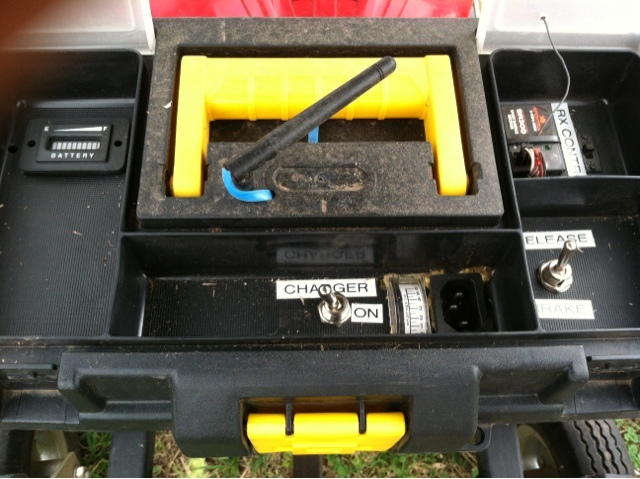 There is also a camera mounted just under the toolbox, facing forward, providing the video stream. On the inside of the toolbox you can see my collection of "brain" components for the mowbot, which are charging components (left side) the motor controller (middle) and power distribution. 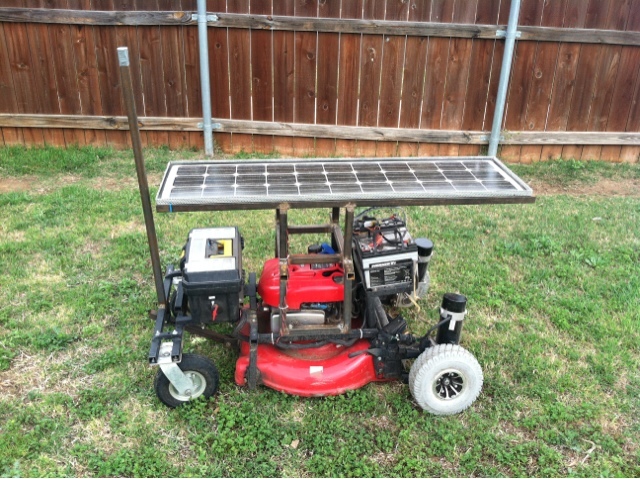 The solar panel puts out around 19 volts DC to a small red board in the middle, which steps the voltage up to 30 volts DC. 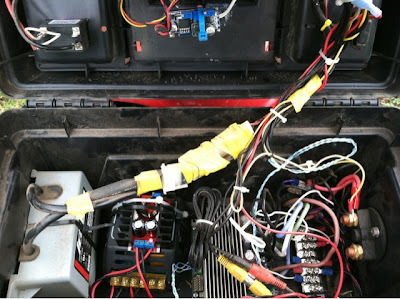 Under the red board is a black box containing a DC to DC solar battery charger, which manages applying power (or not) to the batteries to maintain a full charge.